How does your Chamber compare? 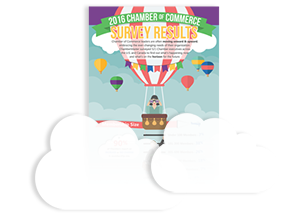 ChamberMaster surveyed hundreds of Chamber of Commerce professionals across the US and Canada to find out about everything from their organization’s operations and policies to marketing plans and revenue goals. The results include details on how Chambers use social media, manage interns, determine membership dues structure, and more. Findings show a positive outlook for organizations regarding membership growth. Additionally, they reveal a common goal by Chambers to streamline their technological efficiency, improve revenue, and recruit younger members. Last year’s results proved to be ChamberMaster’s most downloaded piece of content, so this year the report is provided in an infographic and a brief, on-demand video.